Third and fourth grade art students drew their own coloring book pages, then colored a photo copy of a classmate’s artwork. This project is a winner for artists of all ages – I have done it with high school seniors and they loved it! Last year it became my classic end-of-the-quarter project. After the Showcase was over, this was a fun project that allowed students to think creatively and work together. On the first day, we observed an abstract and realistic example of a coloring page. We talked about how the artwork only had the outlines. They got to choose what the subject of their artwork would be. This is the most fun part for me! I love seeing the wide range of topics that they come up with. It is also a great opportunity for kids who want to get better at drawing realistically to practice drawing from observation. If kids need to see an image in order to draw something, I paste it onto a blank PowerPoint slide. They draw using pencil first and then trace over it with Sharpie. We take two days for this step. As they finish a page, they turn it in to me so that I can put it in the “Copy” folder. If they finish a page early, they can draw another page to have copied. The next step was a little confusing for some of the kids, so I tried to explain it a different way each day we were working on the project. After the second day, I photo-copied all of the coloring pages that were finished. On the third day, they got to pick someone else’s page and color it in using crayons, markers or colored pencils. (I reassured them that they would get back their own original drawings.) Because they wrote their names on the back with pencil, it was easy for me to see which were originals and which were copies. On the third day, they got to choose someone else’s drawing to color in. Each table got more pages to choose from than people who sat at the table. That way the last person to choose still had three options to pick from. I mixed together all of the drawings from the entire grade level. Before I passed out the photo-copied drawings, I gave a pep talk on speaking respectfully about each other’s artwork. Before I passed out the photo-copied drawings, I gave a pep talk on speaking respectfully about each other’s artwork. I modeled polite ways of talking about which artwork you were going to choose (“I don’t care for snakes, so I think I’ll color the drawing of the flower…”) and I gave examples of inappropriate ways of talking about the art (“Eew! I hate snakes! I don’t want that one!”) I was so proud of my students! After doing this project with 28 classes, I only had to talk with one or two kids about speaking respectfully. The coloring portion of this project is so relaxing! I put on mellow music, and the kids get really into coloring their classmate’s artwork. They also love the idea that someone else is coloring their drawing. If they finish the first page early, I give them back their original artwork and they can start coloring it in as well. 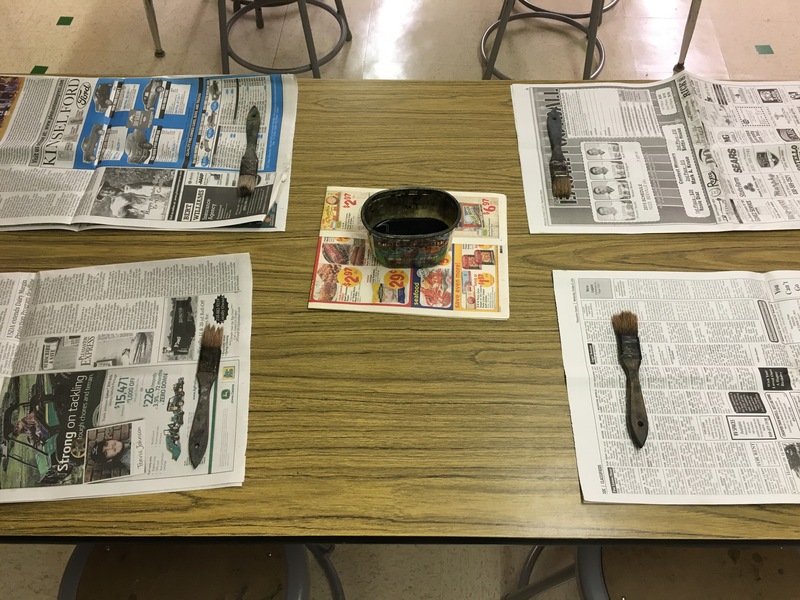 At the end of the class period, everyone leaves with at least two pieces of artwork – their original drawing and the photo-copied drawing that they colored. Use sketchbooks as a way to extend students’ learning after they finish working on their art project for the day. The best change I made to my classroom last year was introducing sketchbooks! The first quarter I used the old “you can free draw on computer paper when you’re done” strategy. Which, let’s be honest, is not a strategy that works very well! Giving students their own sketchbook added so much meaning to the shorter projects I gave them to do after they finished an assignment. Because they were invested in what they were creating, I saw a dramatic shift in how focused my students on their drawings. At the beginning of the second quarter, I decided to make sketchbooks for my 3rd and 4th grade classes. I color coordinated my room by making each class a different color of the rainbow. On the first day of Art, I taught them how to draw block and bubble letters. They drew their names and filled them in with patterns using Sharpie. On each of my PowerPoints, I added a slide at the end for the Sketchbook Project that kids would work on when they finished their artwork. They could always choose to go back and finish an old sketchbook drawing before they started the new one. For the Monster Sculpture project, the prompt was “Draw your monster’s family.” Some students decided to draw a group of monsters who looked similar and other monster families were very different. The first sketchbook project my third graders did was after they completed their Shape Robots. After we talked about what a verb is, we brainstormed ideas of things they could draw their robots doing. It was incredible to see the wide range of ideas they came up with! After the fourth graders finished their Notan Project, I showed them how to create radial symmetry by repeating shapes on a piece of circle graph paper. Creating mandalas was the perfect sketchbook project because it built on our discussions of symmetry for creating notans. The process of drawing mandalas is so calming; it was a nice break for the students who had gotten a bit stressed from the brain work that goes in to creating a notan. One of my favorite sketchbook projects was the Roll a Miro game I found online. After my third graders finished their Miro Creatures using lines and shapes from Miro paintings, I taught them how to play the game. They rolled a dice to choose the eyes, body, arms and color scheme of their creature. Some students just played it once and spent a lot of time on their creature. Other students, who finished a day early, were able to create several creatures. This was a sketchbook project that the kids asked for me to bring out again after our next assignment, especially if they didn’t get a chance to do it the first time. At the end of the Hybrid Animal project, my fourth graders drew their animal throughout it’s life cycle. I liked that this sketchbook project connected the artwork they created with scientific concepts. It was interesting to see how creative they got with imagining how their animal would look at different stages. After they finished using pastels for their Castle Creativity project, I asked my students to draw an inside room of their castle. This was a great extension because they were able to tie in the theme and mood of their castle. A student whose castle was made of ice cream could create an interior drawing that showed the ice cream machines in the kitchen. The comic book project was a huge hit! After my third graders finished their Pop Art Words, I invited them to create a comic strip in their sketchbooks. I had whole tables of kids working together and laughing about the stories they created! This was definitely a project that my students continued working on after the painting assignment was over. One of the most rewarding parts of introducing sketchbooks into my class was seeing how proud my students were of their sketchbooks at the Showcase. I put the sketchbooks out on long tables in the hallway next to the mounted artwork displays. It warmed my heart to see kids looking through other students’ sketchbooks and asking their parents to take their photo with their own sketchbook. It does take some extra time to put the books together before a new quarter starts. I have learned to offer art tickets for doing the job of “sketchbook-making.” Both my third and fourth graders can get quite an assembly line going as we all fold and staple the books together. Usually, I can get them all done in about a week with my students’ help. Using photo references, fourth graders practiced observational drawing by combining characteristics of two different animals to create a hybrid. I wrote my hybrid animal lesson plan the first year I was teaching. I had middle school students, and it was the perfect mixture of silly and structured for them. This year, I decided to try out a variation of the lesson with my 4th graders. They really enjoyed it! I start off the project by showing them examples of Photoshopped animal hybrids, which always grabs their attention! Then I give them a pep talk about drawing realistically. The main point is that drawing is all about teaching your eyes how to see because your hand already knows how to draw the simple straight, curved and angled lines that everything is made up of. I let them choose two photos to use as reference for their animal. I inherited a whole notebook full of animal facts that have great photos, but I also take requests and put photos of specific animals up on the board. The first day is spent sketching their animal. We talk about the different ways that the artists of the Photoshopped examples combined their animals. I spend this class period running around and helping students to “see” the lines and shapes so that they can draw their animal how they envision it. It helps that the final outcome is supposed to look kind of weird and crazy; it takes the pressure off for the drawing to be perfect. If they have time on the first day, they can start drawing their background. I talk with them about habitats and ask them to imagine what kind of habitat their animal might live in. I start off the second class period with a brainstorm about ways that you can color neatly. The kids write their ideas on scraps of paper and I randomly draw several to add to our poster. I have found that this step makes a huge difference in encouraging them to take their time when they start using the colored pencils. Once the first student is ready to start coloring, I have the class circle up to watch a demonstration. I show them several ways to add texture to their artwork using the colored pencils. I usually demonstrate leaves, bark, rocks, fur, feathers, and scales. Then, I’ll ask if anyone has any other textures they’d like to get ideas for. I also show them how they can blend colors by overlapping them. The coloring part of the project goes at wildly different paces for different students. Some students finish in just one day and others need extra time during centers after the assignment is over. When they finish early, their sketchbook project is to draw their animal at different stages during its life cycle. If a student finishes that project early also, they can draw anything they choose in their sketchbook and color it with colored pencils.